Childhood activism: the days of your life? These are the days of our lives…a Queen favourite, with Freddy’s beautiful voice a fitting and moving tribute to a very close friend, played at his funeral this past week. It reflected the wonderful childhood we enjoyed, able to play out in the streets, able to explore the woodland nearby, able to look forward without fear of environmental and social collapse. Hyperbole? I’m not sure it is. We were largely carefree, although perhaps I wasn’t typical: I joined the Ecology Party (forerunner to the Green Party) aged 16, while most of my mates were tearing about on motorbikes. Listening to my own daughter and her friends, climate change and concern for the environment are very much on their minds. 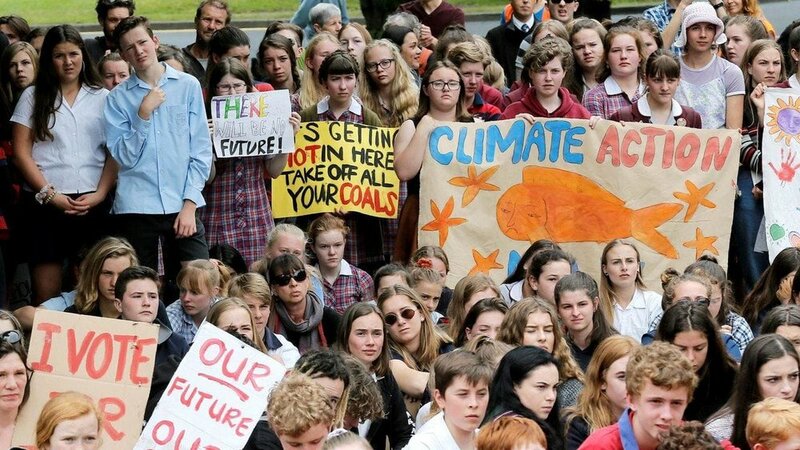 It is their generation now asking the difficult questions, trying to understand our collective failure as adults to show some stewardship for the planet, and wanting to drive change in thinking at a global level. So, when their days should be stress-free, they’re having to face up to all this stuff. While many of us are quick to heap praise on Greta Thunberg, the Swedish schoolgirl whose climate strike action has now spread to become a global phenomenon; is it right that we’ve allowed the state of our planet to become their problem? Shouldn’t our young people be able to grow up free of fear and enjoy the excitement of those formative years? We all lived as though resources were infinite and our lifestyles sustainable (even if the word wasn’t in use). Think about this too often and the guilt it engenders can be overwhelming and, on occasions, lead to some pretty dark places. But, let’s acknowledge this guilt and use it as a motivator for action. There can be no doubt that while our early experiences may not all have been so liberating and free, we all had it good in comparison to the future faced by teenagers today. So, why not channel these feelings and use them to inspire action alongside – in partnership with – today’s youth. This is not a call to arms, to get marching and encourage your own children to go on strike (but, that’s cool by me, by the way); rather, it’s about reconnecting with young people. Not telling them, but listening to them; not frightening them, but reassuring them; not dissing their ideas and aspirations, but engaging with them. It doesn’t need to be difficult, and certainly doesn’t need to be expensive. I hear an awful lot of comments about young people ‘being on their screens’ all the time; how they don’t communicate anymore; that they prefer to be online rather than outside. But how many of us have actually offered them a choice, an alternative? Try developing a shared interest in something that gets you out and about? If you’re lucky enough to have access to a local greenspace, then make the most of it – I turned the Pokemon Go craze into a positive ‘get out and explore’ experience, and have continued to build on that through initiatives such as ‘Beat the Streets’ and other urban orienteering activities https://www.britishorienteering.org.uk/home). If exploring by foot isn’t your thing (or your child’s, for that matter), cycling, roller-skating, skateboarding, and even kayaking (see ‘Canoe Near You’www.britishcanoeing.org.uk). Share in the learning experience your child gets through school. You’d be amazed the topics they discuss across a variety of subjects. They are talking about sustainability; they know about climate change and what it means for their future; they have opinions about plastics, recycling, air pollution, saving water, etc. Show an interest and you might learn something, too. Maybe I’m just fortunate, but my daughter and some of her friends have recently met with their Head Teacher, to present their case for the school developing a sustainability plan and aiming to go C-neutral. Their own idea, and certainly something I’m happy to back them on. I do feel strongly that having an environmental conscience should not weigh heavily. Instead it should be something to celebrate. Let’s make it fun to do the right thing and live sustainably. Childhood should be a time of discovery, exploring the world around you and feeling that you have choices, with a whole life ahead of you. We should all be able to look back and say those really were the days of our lives: a fun time but where we achieved something special. Today’s youth stand on the verge of achieving great things. Let’s work with them to help secure a better future, for these ARE the days of their lives. Let’s make them count. So, on International Day of Women In Science, I found myself thinking back to my own university days, studying Environmental Sciences, on a course dominated by women. Was there a reason why so many young women were attracted to ecological studies? How many have gone on to have successful careers? And who are the women currently shaping the science that’s addressing the key environmental issues of the day? Countless women have played pivotal roles in the study and protection of the environment. These are just a few to celebrate. Five of the best from a very large field. Now, I’m biased as someone who loves trees and who has a fascination for all things African. So, my first choice is Wangari Maathai, a truly remarkable women deedicated to planting trees. Shei is almost single-handedly responsible for bringing trees back to the Kenyan landscape. In the 1970s, she founded the Green Belt Movement, encouraging Kenyans to replant trees to replace those cut down for firewood, farm use or plantations. Through her work planting trees, she also became an advocate for women's rights, prison reform, and projects to combat poverty, demonstrating the inter-relationships between environmental protection and social justice. In 2004, Wangari Maathai became the first African woman and the first environmentalist to win the Nobel Peace Prize for her efforts to protect the environment. A truly inspiring woman. Going back to the early days of the global environmental movement, my next choice is author of the seminal work, Silent Spring. Rachel Carson’s book brought national attention to the issue of pesticide contamination and the effect it was having on the planet. It spurred an environmental movement that led to pesticide-use policies and better protection for many animal species that had been affected by their use. However, her work goes far beyond that. Rachel Carson was first a marine scientist working for the U.S. Fish & Wildlife Service in Washington, DC, primarily as a writer and editor. She wrote about geological discoveries from submarine technology and underwater research, of how islands were formed, how currents change and merge, how temperature affects sea life, and how erosion impacts not just shore lines but salinity, fish populations, and tiny micro-organisms. Climate change, rising sea-levels, melting Arctic glaciers, collapsing bird and animal populations, crumbling geological faults; all are part of her work. In Silent Spring she asked the hard questions about whether and why humans had the right to control nature; to decide who lives or dies, to poison or to destroy non-human life. In showing that all biological systems were dynamic and by urging the public to question authority, Rachel Carson became a social revolutionary. British primatologist Jane Goodall is best known as the world's foremost expert on chimpanzees. She studied the primates for over five decades in the forests of Tanzania. Goodall has worked tirelessly over the years to promote conservation and animal welfare. In July 1960, at the age of 26, Jane traveled from England to what is now Tanzania and ventured into the little-known world of wild chimpanzees. Through nearly 60 years of groundbreaking work, she has not only shown us the urgent need to protect chimpanzees from extinction; she has also redefined species conservation to include the needs of local people and the environment. Today, she travels around the world, writing, speaking and spreading hope through action, encouraging each of us to “use the gift of our life to make the world a better place.” As a conservationist, humanitarian and crusader for the ethical treatment of animals, she is a global force for compassion and a UN Messenger of Peace. Vandana Shiva is an Indian activist and environmentalist whose work on protecting seed diversity changed the focus of the green revolution from large agribusiness firms to local, organic growers. . She didn’t start out as an ecologist, though, first training as a Physicist at the University of Punjab,and only later shifted to inter-disciplinary research in science, technology and environmental policy, which she carried out at the Indian Institute of Science and the Indian Institute of Management in Bangalore. In 1982, she founded an independent institute – the Research Foundation for Science, Technology and Ecology in Dehra Dun – dedicated to high quality and independent research to address the most significant ecological and social issues of our times, working in close partnership with local communities and social movements. In 1991 she founded Navdanya, a national movement to protect the diversity and integrity of living resources – especially native seed – and to promote organic farming and fair trade. For last two decades, Navdanya has worked with local communities and organisations, serving more than 500,000 men and women farmers, resulting in the conservation of more than 3000 rice varieties from across India. The organisation has established 60 seed banks in 16 states across the country. 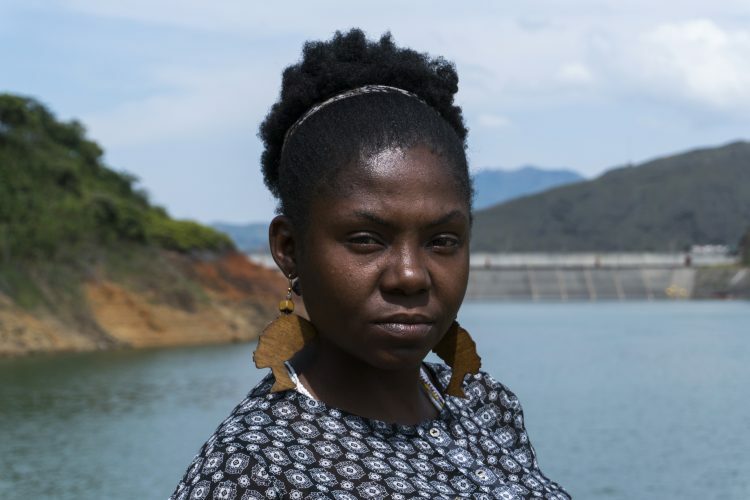 Francia Marquez is a formidable leader of the Afro-Colombian community, who organised the women of La Toma and stopped illegal gold mining on their ancestral land. Illegal miners used mercury and cyanide to extract the gold from dirt and rock. These toxic chemicals flowed directly into the Ovejas River, contaminating the community’s only source of fresh water. Mining camps transformed into small cities, much like the boom towns of the California Gold Rush. With populations of up to 5,000 people, these cities gave rise to prostitution, illegal drug use, and rampant violence as miners preyed upon and clashed with local residents. Francia exerted steady pressure on the Colombian government and spearheaded a 10-day, 350-mile march of 80 women to the nation’s capital, resulting in the removal of all illegal miners and equipment from her community. single mother of two who was born in Yolombo, a village in the Cauca region. She first became an activist at 13, when construction of a dam threatened her community. As a young woman, Francia became a local leader who took on the struggle for environmental and ancestral land rights, fighting and beating back incursions into La Toma by multi-national mining companies. She also educated farmers in her region on sustainable agricultural techniques and worked to promote Afro-Colombian cultural and land rights. In order to attract talented young women into the environmental field, it is important that we all work to remove barriers to progress and ensure a level playing field of opportunity. There are so many great female ecologists, who we should celebrate for their important scientific and cultural contributions, and who serve to inspire the next generation of women in ecology. Maybe winter has finally arrived?! As temperatures drop and the weather disrupts lives up and down the country, how should we respond in ways that are sustainable? There’s got to be an approach other than ramping up the central heating, right? After all, four out of ten of us are avoiding switching on the heating during colder spells due to fears about energy bills. At the same time, around of third of us complain that we can’t get our homes as warm as we’d like. As it turns out, there are plenty of little steps we can take which, when put together, amount to a sensible, sustainable way to deal with the cold snap. For little or no investment, you can easily warm up, and even have fun while doing it. It may seem obvious, but start by wearing clothes - the right ones! Dress in wool, wear several layers, and put a pair of slippers on. Don’t get too comfortable, though: do go outside, as it will help your body adjust better to the cold. Drink hot drinks, as this will raise your core temperature. Sorry, but avoid alcohol, as this will do just the opposite, lowering your core temperature. Why not do some baking, and leave the oven door open afterwards, while you’re snacking on a freshly-baked loaf of bread or cake! Then, of course, there’s eating warm food, and plenty of it. Then you’ll feel the benefit of staying fit, which keeps you warm even when you stop moving. Why not light some candles - they add heat and create atmosphere (always good at this time of year). Now, this may sound odd, but try taking a cold shower; it really does improve blood circulation. And, to cap it all, hug someone - shared bodily warmth and all that! Around the house there are a number of quick wins. To start with, during cold weather, set your thermostat as low as is comfortable when you are at home during waking hours. Reducing the heat by only a few degrees when you're sleeping or out of the house will help save money. 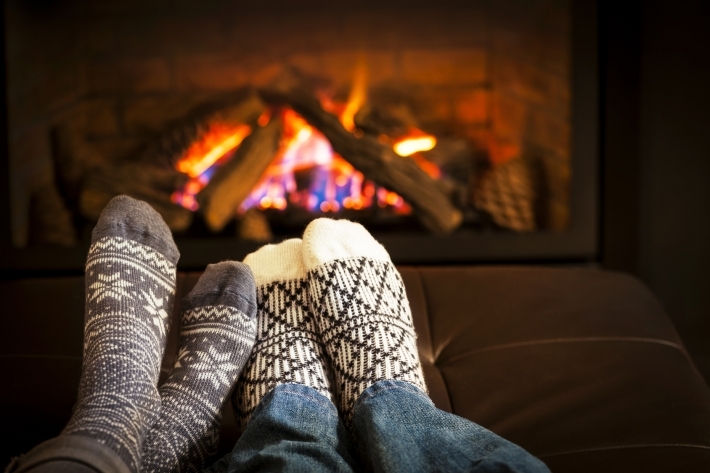 Reduce heat loss through the fireplace. it’s also vital that you draught-proof your home and ensure that your pipework is insulated, too. An obvious thing to do, but one which many people overlook, is bleeding your radiators, in order to avoid cold spots in your home. While you’re at it, get up in the loft and make sure it’s properly insulated, and check your hot water cylinder as well. Close your curtains before it gets dark or while you’re away from the house. A lot of heat escapes through windows, and you’ve paid for it - so keep it in! That way you stand a chance of keeping the temperature consistent, and it gives you a fair chance of keeping the heat in overnight. 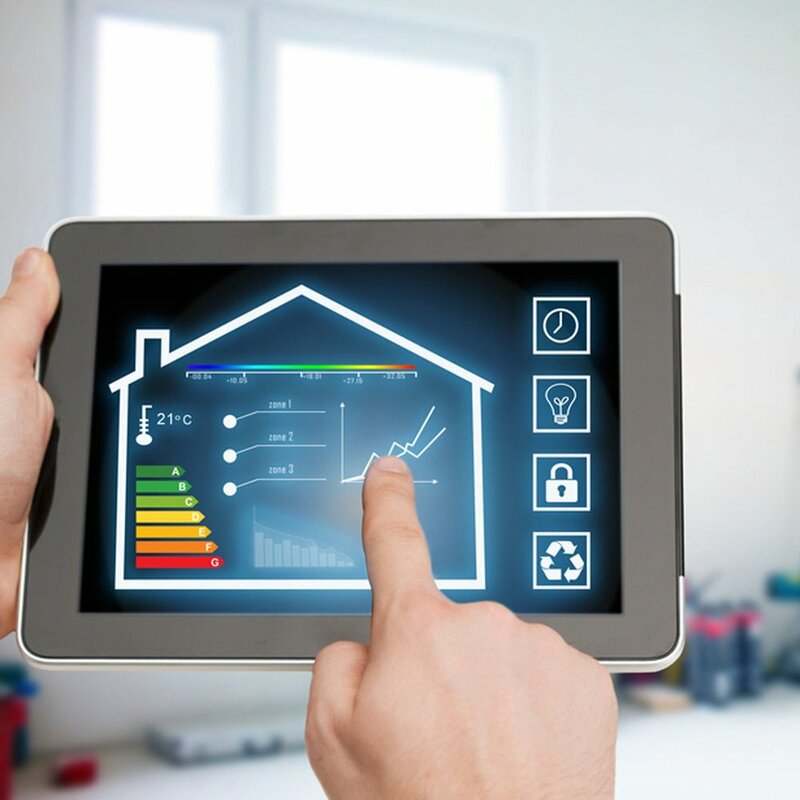 If you still want to embrace technology, then a smart thermostat is a low-cost way to improve the efficiency of your existing heating system, allowing you to control your heating from your phone or tablet. “Isn’t it wrong to add a monetary value to nature? It’s more important than that.” So I was told by a good friend, last week. It’s not the first time I’ve had this said to me (not that it’s my fault, by the way). There remains real tension around the topic of valuing nature, criticism relating to the morality and efficacy of doing so, and fear that it could facilitate the treatment of nature as a commodity to be traded. Natural Capital has been described as the things we get for free from the natural world. Therein lies the problem. If we don’t recognise the true value of nature, we’re unlikely to take care of it. We may not like this uncomfortable truth, but the evidence is out there for all to see. The Office of National Statistics has calculated the economic value of the UK’s natural assets to be £1.5 trillion – an unimaginable figure, but one that’s recognised to be a substantial under-estimate of the true value. From an environmental perspective, a strong case can be made for a pure nature conservation approach involving policy interventions such as incentive payments and protected areas. These can be effective in maintaining environmental components and restore natural systems. But, such an approach is limited by the practical and political difficulties of restricting commercial activities and the mounting costs in a time of such social and environmental change. If we can attach realistic value to the goods and services we obtain from nature, then we might just be able to start addressing our natural capital debt. Here in the UK, our ecological footprint is running at 3.5 planets. Industry pays for wetland restoration that helps to purify water. This in turn offers recreational opportunities. Food-chain businesses pay for habitat creation, which helps to conserve wildlife. This brings reputational benefits. Insurance firms pay to slow water runoff and increase infiltration, helping to reduce flood risk. This results in lower insurance pay-outs and premiums. 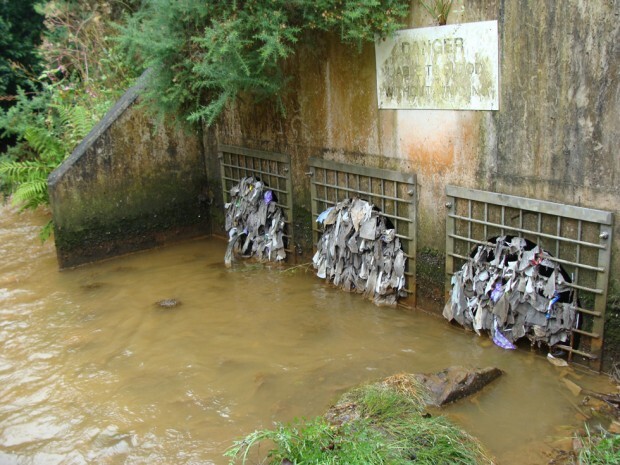 Water companies pay to reduce pollutant input or loss, improving soil and water quality. This helps reduce treatment costs. This natural capital approach can deliver environmentally beneficial outcomes in situations where there is short- or medium-term economic advantage to protecting the environment. It’s less successful when there’s no realisable, short-term economic advantage, such as conserving the most valuable wildlife habitats. This still requires a more traditional nature conservation approach. We’re seeing a growing interest in Natural Capital Accounting, and this is highlighting that there is currently a considerable gap between the costs to business from any depletion of natural capital and the value lost by society as a whole. Fortunately, the costs of action to preserve natural capital may be considerably lower than the value of the natural capital. This creates opportunities for business to invest in actions that can improve conservation outcomes and reverse natural capital depletion, establishing themselves in an increasingly green, ethical marketplace. However, the costs of restoring natural systems at any meaningful scale are so great that the benefits to a business are likely to be insufficient to support a case for action, at least in the absence of shared responsibility or a strong sense of philanthropy. Because it captures the true value of goods and services, the natural capital approach drives business action to reduce negative impacts, maintain beneficial practices and put right any damage. A role still remains for nature conservation, most notably where the benefit is to society at large, rather than an individual entity. By adopting an aligned approach, it becomes possible to increase the overall resources available to improve protection and restoration of our natural systems. Wouldn’t it be great to do more than simply aim to maintain our biodiversity (although, in truth, we’re still losing that battle)? Taking a new approach offers us the opportunity to have a net positive impact on our environment. It's their future - let them speak! “Dad, why don’t people listen to us? It’s our future and we’ll have to live with the mess”. So said my 11-year old daughter, overhearing me talking about the climate change talks in Katowice, Poland. And, to be fair, too frequently the only faces you ever see at the top table for these events are adults, and most often men. She has a point. Think young people don’t care. Think again. A pioneering lawsuit against the U.S. government has won the right to a trial, overcoming the Trump administration's efforts to cancel it in court; and it’s pioneering because it’s being pursued by a group of 21 youths who are suing the United States government for failing to adequately protect the Earth from the effects of climate change. They claim the federal government’s promotion of fossil fuel production and its indifference to the risks posed by greenhouse gas emissions have resulted in “a dangerous destabilising climate system” that threatens the survival of future generations. 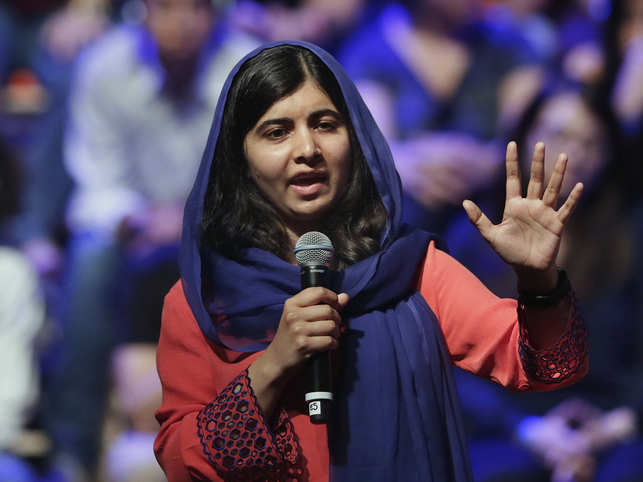 Across the globe, young people are mobilising, and we’d all do well to listen. 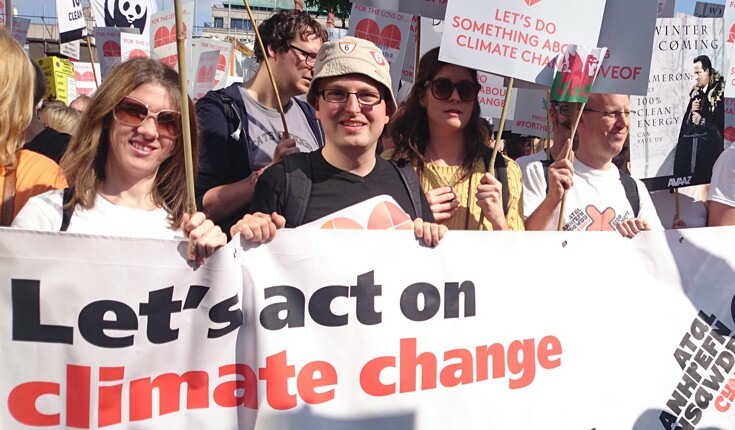 While young people are one of the groups most affected by environmental problems like climate change, they are also the most innovative in terms of fighting for a better world. Fortunately, there are many older people in developed countries now realising that the consequences of a high carbon lifestyle, that has been enjoyed throughout their lifetimes, represents a threat to the viability of any kind of similar life for their descendants. Grandparents care, it seems. This realisation has spurred a wave of actions from divesting from fossil fuel related investments, to buying shares in the companies that pollute in order to have a say at shareholder meetings. There is now a growing unity of purpose between people of all ages who want to turn the tide of human behaviour. We shouldn’t doubt the passion, knowledge and organising abilities of the global youth movements that are emerging. 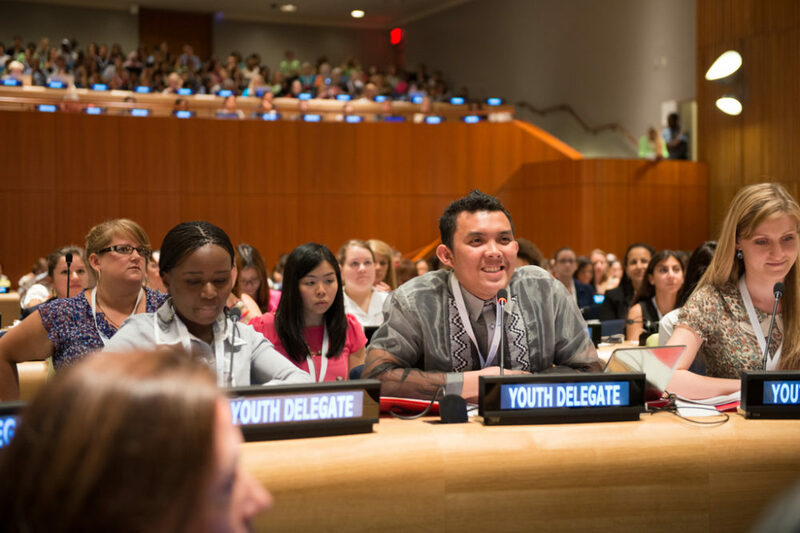 Take the UN’s Youth Climate Delegates (YOUNGO) for example. They show an impressive level of organisation, depth of knowledge, and clarity of message regarding what needs to happen. There’s also the required determination to achieve a set of global goals. However, enthusiasm alone doesn’t guarantee them a voice. Back at Katowice, with 24 years of climate negotiations behind us and the situation currently at a very critical stage, surely there is no conceivable downside to allowing expert young people into the party negotiations? After all, these young people represent the conscience of each nation and, frankly, come with a moral license to kick much harder than the weary veterans in this struggle.Why shouldn’t young people be given the opportunity to take on the role of the negotiators? Well, I spend a lot of time with young people, often working with students, and I can’t recall meeting a single one who didn’t care about global warming or social justice or trying to build a better future. Yes, millennials are a large and diverse group, and studies show how they value authenticity and transparency, and are more likely to be recyclers and conscious consumers. It’s sometimes referred to as the ‘Malala effect’. Their interest in the greater good is driving their engagement with various causes today, and their activism is on the increase. Growing up in this period of rapid man-made change, they are the most globally connected ever, building an activist community online. They may well be induced to march; they might even sue the government for its failure to protect their right to a healthy environment (as we’ve already seen). However, it starts, builds and evolves with social media (you see, it’s not all bad). We’re seeing people getting involved in social activism at a much earlier stage in life, with the capacity to arrange coordinated global protests in a matter of days. In view of this, isn’t it time for NGOs, charities and global campaigns to learn to mobilise this movement? They need to establish effective social media management strategies, otherwise they stand to lose the 28% of young people who rely on social media as their primary source of news. And there’s the 43% of millennials who make financial donations through online platforms, or the one in two who share ideas with their friends online. While the world leaders signing accords in conference halls are important, the real change is going to come from Generation Z. They are the consumers, employees, employers and future leaders who will see the devastating effects of climate change. Let’s give them a voice, listen to their message, and empower them to shape policies and structures that will determine their future. So, it’s Green GB Week. It’s a landmark week of action, or at least that how the Government describes it. It also goes on to claim that it celebrates ‘clean growth’. Read on and you find that the Clean Growth Strategy represents “an ambitious blueprint for Britain’s low carbon future”, setting out proposals for decarbonising all sectors of the UK economy through the next decade. Great stuff, you’d think. Forgive my slight cynicism here. This week has seen the start of fracking operations by Quadrilla, after a lengthy legal battle. Now, correct me if I’m wrong, but this is about squeezing out further fossil fuel reserves and, as the company’s own Chief Executive admitted in a BBCRadio 4 interview, if “we don’t do it, someone else will”. Remember that only one week ago, the IPCC issued it’s latest and perhaps most challenging climate change report. We need to keep no less than 80% of the remaining fossil fuel reserves in the ground if we are to stand any chance of keeping global temperature rise to 1.5C above pre-industrial levels. There’s an awful lot of stuff going on here, not much of it logical. However, my biggest gripe is with the constant use of the term ‘growth’. Isn’t it growth that’s got us here? You know, in this mess? It’s been the obsession with economic growth that has led to the over-exploitation of the Earth’s resources and the resultant ecosystem degradation. As chance would have it, I’m reading Kate Raworth’s excellent ‘Doughnut Economics’, and so forgive me if I’m a little obsessed myself. I’m obsessed with the idea of growth (mind you, I always have been; it’s just that I’ve found out that I’m not alone). Every politician, it seems, feels obliged to protect people from the uncomfortable truth, continuing instead to peddle the line that we can have GDP growth. We can’t. It has to end somewhere (even with clean, green, sustainable, balanced, long-term or all the other catchphrase versions they like to come up with). ‘Doughnut Economics’, the sweet spot that meets the needs of all within the means of the planet. But, can we stop obsessing over growth at all costs? But, rather than argue about the suitability of one definition over another, I’d prefer to look at the alternatives to growth in economic terms. What about growth as measured through health & wellbeing, access to food, housing, education and the development of skills, or social justice more generally? Besides, shouldn’t we be thinking about post-growth instead? Don’t get me wrong. Anything that leads to big business genuinely stepping up action on climate change is to be welcomed. Investment in innovation is laudable, of course, and it’s right that we should be nurturing low carbon technologies, processes and systems. It’s just that there are always caveats (for example, the Government is clear that steps to decarbonising need to be '“as cheap as possible”); caveats that, in my view, rather ignore this bigger question about growth. 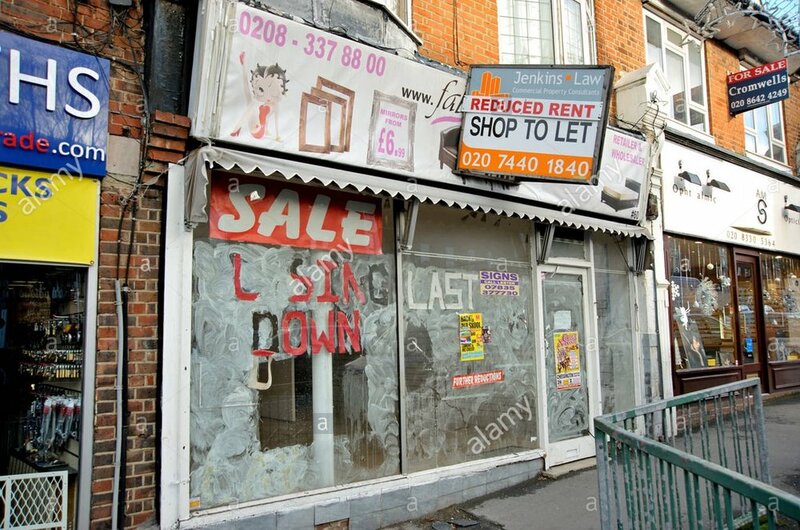 Isn’t it about time we stopped the ‘window dressing’, the rebranding of economic growth, and at least began an open, honest conversation about the need to make a radical shift towards a post-growth world, where we identify and work towards other forms of value? We might even stand a chance of meeting the UN’s Sustainable Development Goals if we did. It’s not an easy message to share, and certainly won’t be popular at the ballot box in the short-term. But, we need to get through these growing pains, to emerge on the other side in a world that can be sustainable. 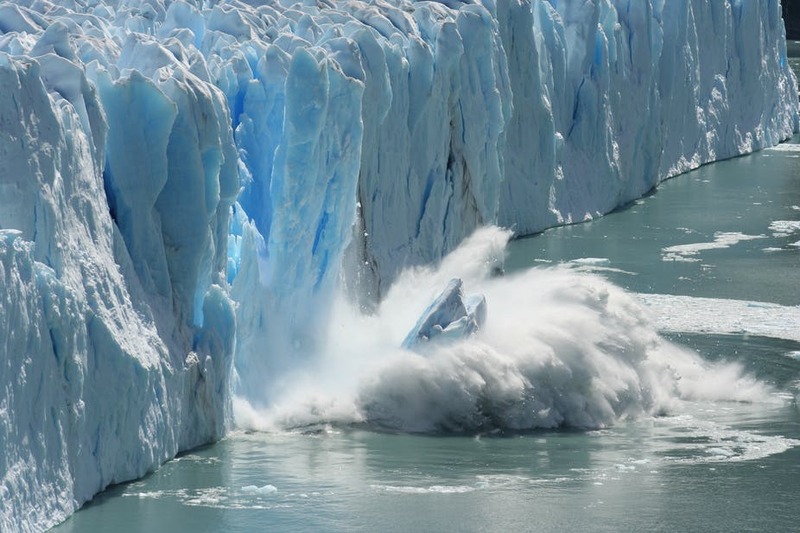 Climate change news is, by definition, bad news. This week has been nothing but bad news, it seems. If you read it all or listened to news bulletins, you could be forgiven for thinking “there’s nothing I can do. It’s too big an issue”. The challenge seems so enormous the natural response is to throw up our hands in despair and assume there’s nothing we can do to make a difference. Not so. Here’s some optimism. Break it down into the little things that contribute to climate change: things such as how we work and travel, what we buy and eat, our domestic routines. These have the potential to tip the balance one way or the other. If we’re up for being part of the solution, then we can begin to change our personal habits in positive ways. It might be as basic as reminding yourself to switch off a light when you leave a room, turn down the thermostat by a couple of degrees, or even go a day without meat, but when you repeat them over a period of months and years, the impact on the environment is profound and long lasting. Form a climate friendly habit, and you know what - you can save money, be healthier and protect the environment! So, how about we all set some house rules? The home is where we consume most of our energy, and it’s where we can make the biggest impact in the battle against climate change. There are the actions we all know, like turning off lights when not in use, not leaving the TV in Standby mode, stopping the water tap running when brushing our teeth, and so on; nag, nag, nag - we’re getting there in our household! But, looking for somewhat bigger gains, let’s tackle the washing machine. After all, washing in colder water (around 30-40°) is just as effective as hot water In fact, it may even be better at preserving your clothes, retaining the texture and colour of the fabric. More importantly, since about 70-80 percent of the energy required for a washing machine goes into heating the water, it’s cheaper as well as more environmentally friendly. It has to be said that some investments may be necessary in order to make your home a much greener place. Some are relatively cheap, like replacing any traditional light bulbs with LEDs, which use up to 80 percent less energy and last 25 times as long. You might also think about acquiring a smart meter to track your consumption – many energy companies now offer to install these for free. For a more comprehensive option, you can obtain monitors and plugs that not only track your energy consumption in detail, but enable you to operate the electrics in your house remotely via an app on your phone. This means you can crank up all of the appliances a few minutes before you enter the house and power down as soon as you leave. When it comes to buying major appliances like a cooker, fridge freezer, washing machine or dishwasher, it’s really a no-brainer to look for ones that are more energy efficient. They might cost a bit more initially, but after a couple of years the savings on your energy bills will have cancelled out the difference. Look out for the EU energy rating system – it goes from A+++ (most efficient) to D or G (least efficient) depending on the appliance. Our consumption behaviour is crucial. Again, there are some familiar ways to help the environment, like choosing food with less packaging, buying locally-sourced produce, and opting for organic produce that uses less pesticides and synthetic fertilisers, most of which are by-products of oil refining. But there’s a growing awareness of how our diet itself is affecting climate change. Animal agriculture amounts to as much as 50 percent of the world’s greenhouse gases. Reducing your consumption of meat, specifically beef, can have a surprising effect on the environment – for example, half a kilo of beef is responsible for 18 times the emissions of half a kilo of pasta! Outside the home, our most obvious personal impact on the climate comes from the ways in which we travel. With Electric Vehicles (EVs) becoming cheaper and more practical, now is the time to think seriously about buying one when next looking for a car, especially given the restrictions already starting to come into effect on diesel cars in cities, with some countries like France, Spain and Sweden even set to ban them in the next five-to-ten years. In the meantime, we can all make sure our cars are at least running efficiently by fully inflating tyres to improve gas mileage and driving in such a way as to keep fuel consumption down. But if it’s as practical and cheap to take a train then do that, and if you can make journeys by bicycle or on foot, even better. Why not decide to have car-free days each week, if feasible. Beyond taking all these practical steps, remember that we each have a voice! If you’d like to use a bicycle but there are no bicycle lanes in your local area, start campaigning for them. As with all climate change issues, activism is incredibly important: talk to neighbours and friends, contact your local councillor or MP, set up community groups that might be involved in tree planting (a single tree will absorb on average one ton of carbon dioxide during its lifetime), car-sharing or raising awareness about pollution. Finally, think about offsetting your carbon emissions, especially when you travel by air. You can do this in any number of ways. For instance, you might calculate the cost of your carbon footprint for any given journey and then choose to donate the equivalent to an organisation involved in combating climate change. It might seem flippant to say this, but try to have fun tackling climate change. Create an element of competition within your household or local community. Support one another to make a difference and, perhaps most important of all, celebrate your achievements. Having a tidy out at work or home reveals many things: just how much stuff you’ve squirrelled away and just how much of it serves no useful purpose anymore. Or does it? Planned obsolescence is a thing, sadly: certain gadgets, cars and other tech have deliberately short lifespans, to make you shell out to replace them (which is why you stashed them away, out of sight, in the first place). Lightbulbs and various other technologies could easily last for decades, many believe, but it’s more profitable to introduce artificial lifespans so that companies get repeat sales. Is this true? Does planned obsolescence really exist? The answer, it seems, is yes (to a point). If we look beyond the somewhat cynical idea that greedy companies are wantonly fleecing their customers, we need to accept some of the blame, too. Planned obsolescence is an inevitable consequence of sustainable businesses giving people goods they desire. It serves as a reflection of a ravenous, consumer culture which industries did create for their benefit, but one that consumers have been only too willing to embrace. It’s not new, either. Competition between General Motors and Ford in the new 1920s auto market led the former to introduce the now-familiar model year changes in its vehicles. GM had pioneered a way to entice customers to splurge on the latest, greatest car, to satisfy themselves and impress those in their social circles, thereby creating a model for all industries..
Inexcusably, it’s very much alive and well in various forms, from subtle to unsubtle. From so-called contrived durability, where brittle parts give out (think small electrical home appliances), to having repairs cost more than replacement products (how about fridges and TVs), to aesthetic upgrades that frame older product versions as less stylish (think music systems, including headphones - getting smaller, year by year) – goods makers have no shortage of ruses to keep opening customers’ wallets. For a really up-to-date example, consider smartphones; we all know what’s going on, but we appear locked into the “I must have the latest model” argument. These handsets often get discarded after a mere couple years’ use. Screens or buttons break, batteries die, or their operating systems, apps, and so on can suddenly no longer be upgraded. Yet a solution is always near at hand: brand new handset models, pumped out every year or so, and touted as “the best ever”. Fortunately, there are companies out there who are challenging this. One of my favourites, Fairphone, point out that “Many of us, (around 400 million by the third quarter of 2017) have a brand new phone that we’re getting to know, and an old phone, our constant companion for the last 1.7 years, who’s about to disappear into the messy drawer we all have”. It’s all too easy. Fairphone make the case: by recycling and reusing old phones, we can give them new lives in new homes, or recover valuable materials like gold, copper and palladium. We can reduce the environmental impact of manufacturing new phones, AND make the environment inside our messy drawers a bit cleaner! What they’ve done is show the industry that there is another way. Fairphones are built to last. Yes, accidents happen, but that doesn’t have to mean the end of your phone. You can now make it last with easy repairs and replaceable modules, while regular software updates also keep your phone running smoothly. What’s more, there’s a growing market of ethical consumers, shown by present demand for Fairphones far outstripping supply. Printers and printer cartridges, in particular, are another example which really frustrates me. In what is seemingly blatant planned obsolescence, microchips, light sensors or batteries can act to disable a cartridge well before all its ink is actually used up, forcing owners to go buy entirely new, not-at-all-cheap units. Someone please tell me why I shouldn’t be able to just go and get a bottle of cyan or black ink and simply squirt it into a reservoir? It’s crazy! Looking at this, planned obsolescence seems very wasteful. It's estimated that 65 million are sold in the UK every year and that 85% of them are simply discarded or sent to landfill, where their engineering grade polymers can take up to 1000 years to degrade. What’s more, they also contain carcinogens and other chemicals, which can disrupt health making it harmful to both humans and the environment. Put simply, The more printer cartridges that end up in landfill, the more likely it will contaminate our water supplies and soil. Beyond waste, all that extra manufacturing can degrade the environment, too. Fortunately, there are a growing number of recycling schemes for used cartridges, and these are making it ever-easier for business and private customers to do the right thing. Personally, I still find it frustrating that I can’t simply take my empty ink or toner cartridges and have them refilled (with vegetable-based products) locally, before my own eyes. 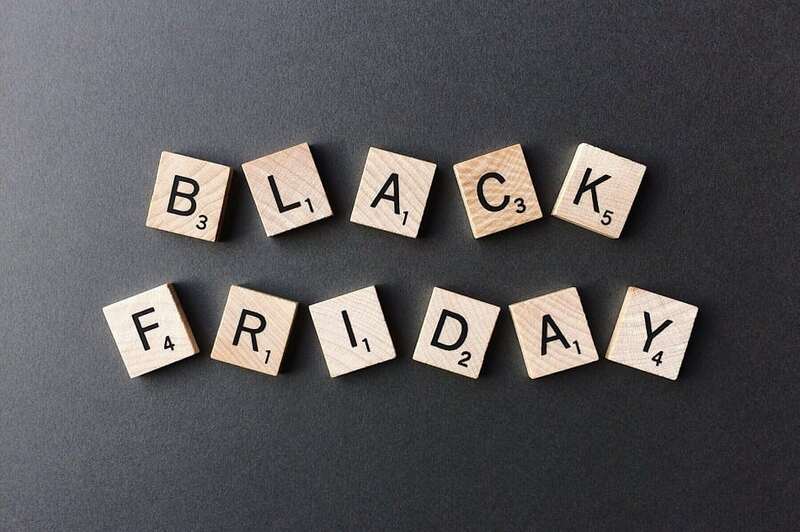 Thankfully, we are seeing refillable cartridges, capable of being refilled from bulk ink bottles numerous times, with claims that a refillable cartridge starter pack can save the consumer over £400 in ink! So, reasons for optimism, then, but still a long way to go. I’d better get back to the tidying exercise, but exercising caution and thinking about deconstruction and up cycling options. Modular products are the way to go, if we’re serious about tackling our throwaway consumerism; but we need to make the right choices in order to drive the market. A business-minded approach to smarter recycling, reuse and repurposing has arguably made a big dent in the planned obsolescence approach, and will so in future. As we enter #ZeroWasteWeek, I find myself taken back to my youth and the often-used words of my mother: "Waste not, want not" - words from a childhood growing up in wartime. Only two days ago, I stood, transfixed, in front of a big shop window, but this was no ordinary shop; it was a library of things. Frome, Somerset, is one of those places where sustainability has begun to mean something practical to local people and 'Share', its library for items of all kinds offers a great way to deliver on mum's obsessive saying. You see, the trouble is that we've got ourselves into a mindset where we buy, own, use and then throw away. The problem is that there is no 'away'; things don't just disappear without trace. How inconvenient for us! As ZeroWasteWeek put it "Away isn't some magical place; it's landfill, an incinerator, the bottom of the ocean, litter or the stomach of an animal. It's always somewhere else..."
So, what's the solution? It's pretty straightforward, actually: we need to reduce waste through reuse, recycling and repurposing material for a longer life. Easy to say, but quite another to do. Where do we start? It remains the case that many - the majority of - people are confused, unsure what the issue is and what role they can possibly play in tackling it. So, why not start by getting the message out. Begin by explaining the zero waste idea. 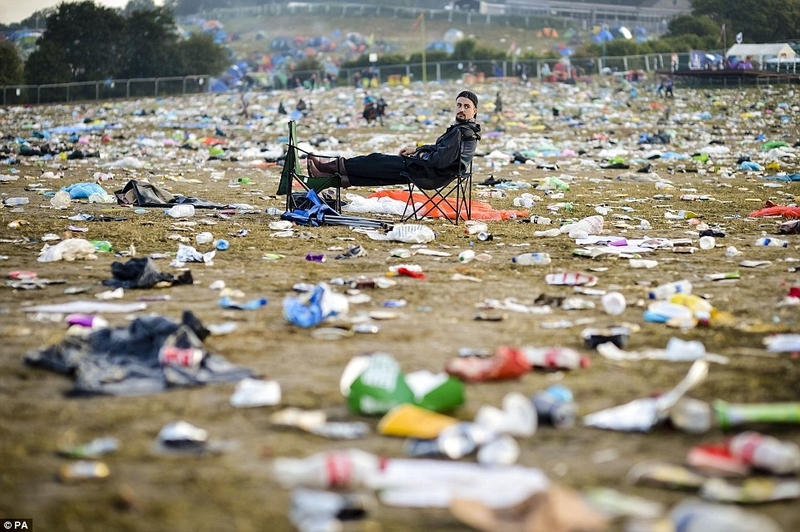 Why is it so important to keep things out of landfill? Why not put forward a few simple tips people could do to reuse things – basing these on your own experience. Ditch those plastic bags when out shopping, by taking your own reusable bags to the shops; get a refillable bottle and fill it with water before you go anywhere; reuse food leftovers as ingredients for another meal, either at home or by donating food to local food waste charities; reuse glass food jars for storing small items; take unwanted items to a charity shop or offer on Freecycle (or similar online platforms, e.g. Share Peterborough - my local favourite) so someone else can reuse them; join the car boot sale community - a great way to make a bit of money and find new owners for those unwanted items clogging up your loft, shed or spare room; make inventive use of plastic food containers (which can often be difficult to recycle) - as flower pots, for storing food in the freezer. There's so much to do. It's amazing what you come across at a car boot sale, and undoubtedly a great way to get new life out of old, unwanted items. Not all of it can be done alone, though. Local authorities need to step up and ensure that they explain recycling facilities and processes clearly, while making it as easy as possible for people to take part. They need to explain how people can recycle things from the kerbside at home and signpost people to where they can find their local facilities. However, they also need to know how and where they can recycle things when out and about. Are we making household recycling easy to do? Facilities need to be easily accessible and understood. I'm always struck by the plethora of recycling logos and the general confusion these cause for people. Perhaps it's time that we shared information on basic recycling logos and how people can recycle those items. So, I've got myself a lot of actions to take over the coming week. Little by little we can make zero waste a reality. We have to - there is no 'away' after all and it's about time we got back to mum's adage of 'waste not, want'. It's not about wartime austerity; it's about ensuring a sustainable future for the planet. 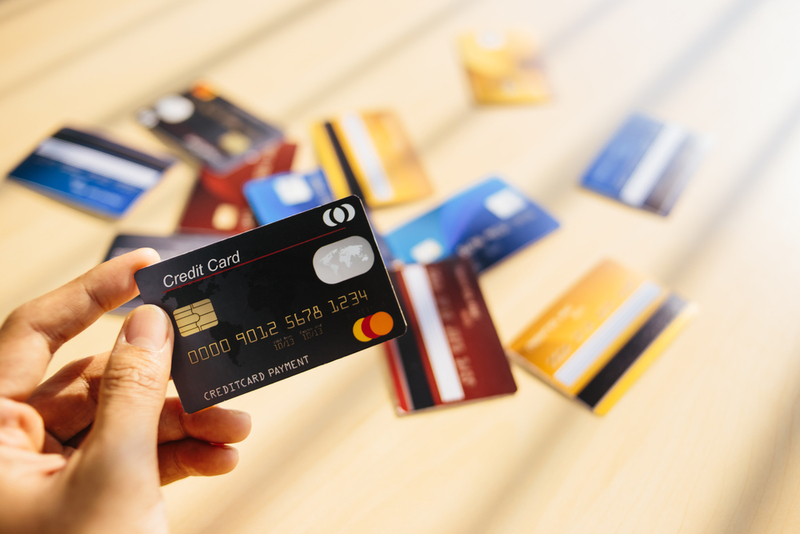 That we live in an age of consumerism is all too obvious: a society in which each household owes an average of about £2,400 on credit cards. Consumer debt causes great distress to many people and, in many cases, is closely associated with mental ill health. So, how do we row back from all this spending? How do we find happiness in living more simply? We have to, for debt is not the only serious consequence of consumerism. Our collective demand for energy, water, land, meat, palm oil, timber, and much else besides is rapidly and irreversibly depleting and polluting the resources and ecosystems on which everyone depends. We are in real danger of going into ecological overdraft. Although it is possible to be a more ethical consumer, generally speaking, spending does translate directly into material consumption. Take clothes as an example, one which exemplifies prevailing attitudes and behaviours. The average UK household spends about £1,700 a year on clothes. About 30 per cent of these garments remain in wardrobes unworn and an estimated £140m worth are sent to landfill every year. Casual consumption and waste creation such as this is highly problematic. Research suggests three of the nine planetary boundaries essential for avoiding unacceptable environmental change have already been crossed. It’s time to recognise that every manufactured item or service we buy comes with several environmental costs. What does this mean for us, the consumer? Put simply, as well as asking ourselves whether we can afford a particular purchase or experience, we also need to ask whether the Earth can really afford to provide it? The prospect of changing our buying habits and expectations may be uninviting, but it helps to remember that personal wellbeing is not about material wealth (once basic needs are met). Powerful evidence can be found in the New Economics Foundation’s Happy Planet Index. The HPI logs measures of life-expectancy, well-being and ecological footprint for 89 nations, and produces an overall score for each country. 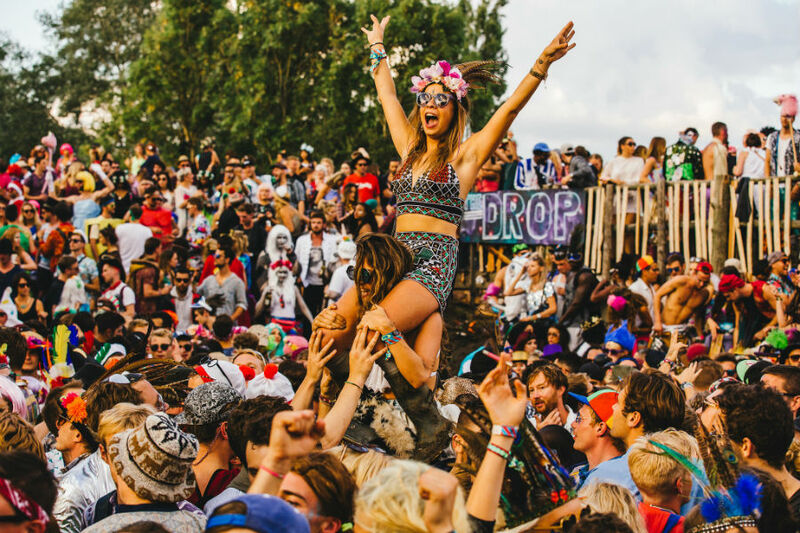 So, who are the happiest people on the planet? Well, Costa Rica is among the top-ranked countries. Although its GDP per capita is less than a quarter of the size of many Western European countries and North America, and its per capita ecological footprint is just one third of the size of the USA’s, people living in Costa Rica enjoy higher wellbeing than the residents of many rich nations, and live longer than people in the US. It’s not surprising to learn that wealth does play a small part in happiness. After all, incomes are more than 25 times higher in the happiest countries than in the least happy ones. In Denmark, another of those happy places, there is a decoupling of wealth and well-being. Danes will tell you that they focus on the small things that really matter, including spending more quality time with friends and family, and enjoying the good things in life. Indeed, we may know deep down that you can’t buy happiness but this intuition often gets lost under the many pressures to consume; we're bombarded by messages - often subliminal - to buy, buy, buy. A much happier future can be ours, though, if we concentrate on cultivating non-material assets such as good relationships, appreciating what we’ve got, a sense of meaning, and new skills, instead of on making and spending money. Standard of living has much less bearing on happiness than the attitudes, values and expectations we bring to the way we live; at least, this holds true once basic human needs are met. Essential for wellbeing are a warm dry home, decent food and reasonable income. The global economic system, fixated on growth and profit, and resulting in environmental destruction, is deeply flawed. Radically different frameworks exist, based on real human needs and environmental limits. The challenge is how we embrace these and make them an attractive alternative to wider society. Clearly, it’s time to get real about this stuff: the Earth’s environmental limits are the ultimate bottom line. There has to be an economic transformation its we are to slow the rapid trend towards disastrous higher temperatures. This will be complex to achieve, but the guiding principle is simple: life offers rich possibilities far more satisfying than constant consumption. All of us who have more than enough, need to learn to become happily modest consumers. Sustainable water consumption is a major challenge for our increasing global population. Already now, a large share of population is suffering from water scarcity and water consumption is a main driver of ecosystem damage. The distribution of the resource and its consumption make it a critical resource in many regions. We face a huge challenge, given that by 2030, approximately 47% of the world's population is expected to be living in areas of high water stress. At a national level, England, Scotland and Wales are projected to be in deficit by 800 million to 3 billion litres per day by 2050 (5–16% of total demand) and by 1.4 billion to 5 billion litres per day by 2080 (8-29% of the total demand). Isn't it about time we took sustainable consumption seriously? One-thirds of the global population (2 billion people) live under conditions of severe water scarcity at least 1 month of the year. 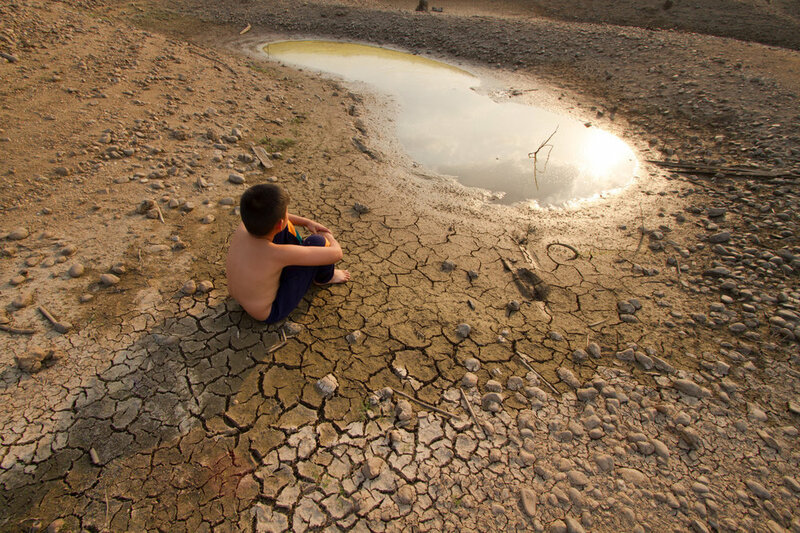 Half a billion people in the world face severe water scarcity all year round. 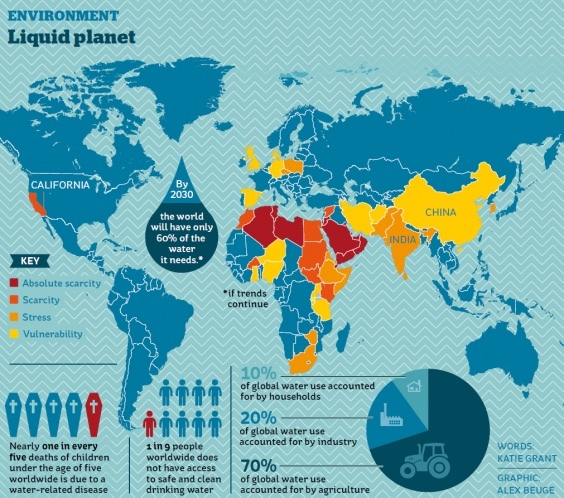 Half of the world’s largest cities experience water scarcity. This growing pressure on water resources – from population and economic growth, climate change, pollution, and other challenges – has major impacts on our social, economic, and environmental well-being. Hosepipe bans, tankering of water to keep up with demand, applications to abstract additional water from already strained reservoir supplies, rescuing fish populations from depleted rivers, and the closure of an inland waterway: these are just a few of the steps taken in the UK in the past month. The fact that water is running out is not new, but what is becoming increasingly urgent is that without action towards sustainable water practices, companies and investors around the world face imminent and significant risks. And yet, it is staggering to discover that of the world's 276 international river basins, 60 per cent lack cooperative management frameworks. This is serious, given the wide range of competing demands. Without changes to business-as-usual, the future is grim. The effects are real and happening right now, right across the globe: in the last 20 years, 55% of China's rivers have disappeared due to industrial use. More than 70% of the western United States has been hit by drought resulting in a loss of approximately $2.7billion to California's economy. In February 2015, São Paulo ran out of water for four days. Within the next 15-20 years, the worsening water security situation risks triggering a global food crisis, with shortfalls of up to 30% in cereal production. Where once there was water! Mega-drought in California - is this becoming the norm? Business leaders have a responsibility to not only take action with sustainable water processes in operations, but also to impact the entire supply chain all the way to the customer. Beyond implementing sustainable water operations, companies and individuals need to work together to create a shift in purchasing behaviour helping consumers to favour water-sustainable products. A huge opportunity exists for companies to save money by putting water management at the centre of their environmental strategy. Businesses can also learn important lessons from the challenges that energy has faced over recent years in terms of reducing use and waste; by using water more sustainably, they can operate more efficiently and effectively. Every business needs to ensure that it is doing all it can to use water as efficiently as possible during manufacturing processes, conserving and treating waste water, while continuously striving to reduce or avoid emissions that pollute the environment. As a means to help inform consumers, many argue that quantifying water inputs, like nutritional and calorie labels on food items, will help to influence purchasing habits, encouraging consumers to resist highly water intensive products. It would incentivise product manufacturers to scale back unnecessary waste and awaken consumer consciousness about water insecurity. Understanding our water footprint may drive some consumers to make better informed decisions. Indirect water use refers to the water that is used to manufacture the goods that we consume or produce, and the services that we use, as well as all of the water that is made unusable by pollution or wasted by non-use. That includes all of the water used to grow the food that we eat eat, to produce the things we use in daily life - clothes, books and furniture - and the water needed to produce the energy we use. While this indirect water is "invisible", we often use far more of it than we realise. In Europe, for example, the average person directly consumes between 100-150 litres of water a day - as drinking water, for washing clothes, bathing and watering plants. But each person also indirectly consumes anywhere between 1,500 and 10,000 litres of per day, depending on where they live and their consumption habits. not disposing of medicines, paints or other pollutants down the sink. Everyone has a fundamental human right to housing, which ensures access to a safe, secure, habitable, and affordable home. Sadly, it doesn't follow that there is an adequate housing supply to meet demand. Politicians make much of the need to build more homes, more family homes, more affordable homes, more social housing. In fact, housing is a hot political topic. A ‘fabric first’ approach is the best approach to creating an eco home. That means prioritising elements such as insulation and air tightness in order to deliver a structure that won’t leak heat. 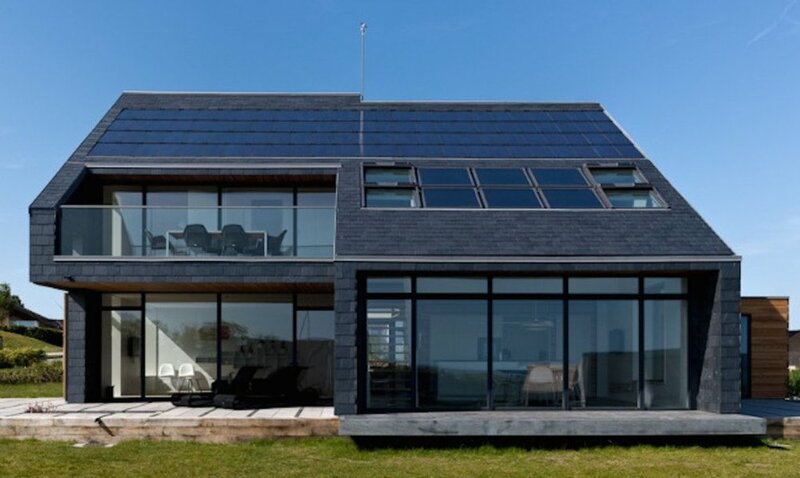 Once you have a suitably efficient building fabric in place, you can begin to look renewable energy sources, such as heat pumps and solar technology. There’s no point in specifying these systems in a house that’s not up to standard as you won’t be able to maximise their potential (you may even end up paying more to run them than you would for conventional alternatives). In the UK, it is claimed that building 300,000 new homes a year would help to make housing more affordable. However, affordability depends upon price and income, not a figure plucked out of thin air. Irrespective, we'll need to step things up. The last time 300,000 homes were completed in a year was way back, in the financial year 1969-70. How can we do it? And can the construction industry respond in a way that is sustainable? The overriding principle in sustainable housing is ensuring it promotes better quality of life and involves less waste, better reliability, lower life-cycle environmental impacts, less maintenance and more re-use. Put simply, the more insulation you can incorporate into the major structural elements of your home (such as the walls, roof and floor), the more heat it will retain and the more efficient it will be in use. Insulation of walls, floor and ceiling or roof space will help to aid in cooling purposely to save on energy costs. Insulation will help in saving money on energy bills and make the house more comfortable because insulation will bar heat passing in and out of the house. It will maintain a comfortable temperature inside regardless of the outside temperature. Fewer gaps in your home’s structural envelope mean less heat lost to the outside world. Prefabricated systems, such as closed panel timber frame and structural insulated panels, tend to offer good air tightness off the shelf. With others, such as brick and block, high-quality workmanship on site is essential. One easy step is to install windows that are double-glazed, as these will help to insulate the house making it cooler during the summer and warmer during the winter (see below re. natural light). Materials such as brick and concrete can absorb warmth from the sun’s rays during the day and release it into the home as external temperatures drop – helping to maintain a comfortable internal environment. Used correctly, this thermal store can help to reduce energy consumption. The installation of solar panels and temperature regulating walls will make a house more eco-friendly and help to keep it cooler during hot weather. Design should aim to create a favourable microclimate, allowing lightweight ventilation in hot, dry climates, while being well insulated with good solar production during winter. Among the most popular technologies for generating energy are solar photovoltaic panels, solar thermal panels, biomass and stoves, and ground-source or air-source heat pumps. Other options include boilers that generate electricity as a by-product of their heating cycles. Maximising the amount of natural light in your home – through good use of windows, rooflights, sun pipes, etc – will help to reduce your need for artificial lighting. However, glazing is much less insulating than conventional walling, so it's important to strike the right balance. Making use of the sun means that you orientate a new home for maximum sunlight. This involves passive solar heating designs and making use of daytime lighting fully. By the use of passive solar, the windows can let in energy and the heat absorbed reduces the need for warming the house during cold periods such as winter. There are various ways to ensure the products and materials you use are as green as possible. One key step is to select non-toxic building materials for constructing the house. Non-toxic building materials lower the environmental impacts over the life-cycle of the building. Another option is to source locally. This is appropriate to reduce the environmental footprint from transportation. Consideration should be given to using natural products, such as sheep’s wool insulation. If you’re buying wood, always look for proof that it’s been sustainably sourced, for instance through FSC certification. During construction, recycling of wastes can be done to reduce their accumulation as much as possible. For instance, materials can be sourced from demolished products which have been recycled. These materials should be durable and easily recycled. The challenge now is to make environment-friendly homes also look easy on the eye, not a combination you would necessarily associate with common innovations, such as solar panels and plastic windows. 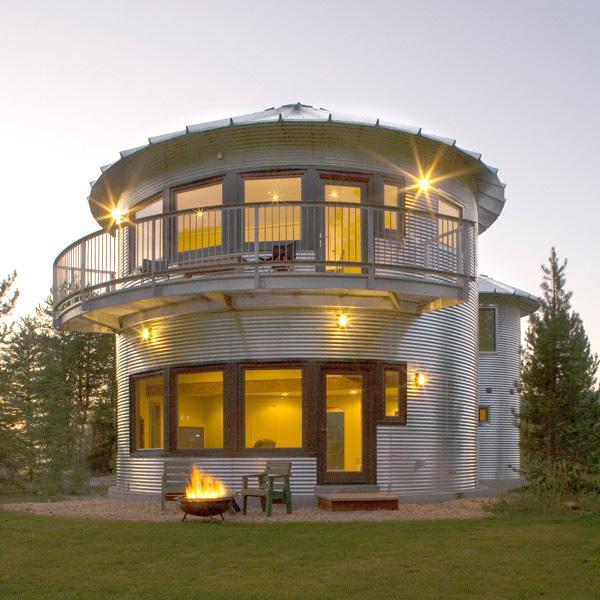 Modern eco-homes are at the cutting edge of innovation. Architects are increasingly competing to achieve super-high performance in terms of heat-retention and sustainable building materials, while achieving fantastic, award-winning looks. Fortunately, this can now be done in ways that are eminently affordable, too. In fact, the constraints of building sustainable, energy-efficient homes actually drive better design. Look and build both have to be of the highest standard to ensure all targets are met. Think about it. Every part of the building has to fit together perfectly to keep warmth in, which encourages cutting-edge design. A key ingredient in a home like this is the use of glass. Triple-glazed, thermally efficient glass is often used on the south side of a property to maximise solar gain. Such homes are also built to minimise drafts, with a high level of insulation for the winter and windows open in summer to enable cross-ventilation. There may be ground- or air-source heat pumps, which use natural energy to warm the home, a bee-friendly, oxygen-producing green roof, and (rarely visible) solar panels too. 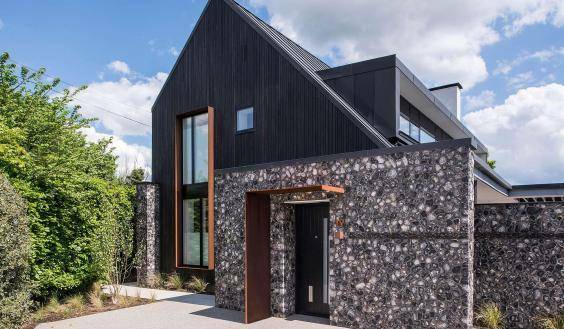 Natural materials such as timber, stone, brick, and glass all retain heat well, so architects combine them with new technology and materials to create spectacular results. All construction systems can be adapted to meet good levels of energy efficiency, but some lend themselves more immediately to hitting the highest standards. Closed panel timber frame and structural insulated panels (SIPs) are two popular options, offering a straightforward route to a well-insulated, highly airtight structure. That’s largely thanks to their large degree of prefabrication, which minimises the potential for human error on site. Find out more about. One of the advantages of SIPs is that the system involves a continuous layer of insulation, with no breaks for studwork. That makes for extremely low levels of thermal bridging (where internal warmth can find a path to escape to the exterior). A variety of other systems have been developed with energy efficiency and sustainability in mind. These include modern methods, such as externally-insulated solid walls, as well as traditional or natural options, such as straw bale building. Modular homes are increasingly seen as a solution to the challenges of meeting the demand for housing and doing so in ways that are eco-friendly. It's an approach that's catching on, fast! Berkeley Homes, which builds 4,000 homes a year, is planning to create a facility in Kent where builders will work to produce up to 1,000 houses and apartments annually which will then be craned on to sites. Another company, nHouse, is setting up a factory in Peterborough with the capacity to build 400 homes a year, complete with light fittings, bathrooms, bookshelves and kitchens; and claims it can build a house in 20 days in the factory which can then be erected on site in half a day. Several other developers, including Legal and General and Urban Splash, have also launched prefab home divisions. From social housing, through private housing, to student accommodation, design companies are working in close partnership with construction firms to create robust modular houses to meet the most demanding requirements. Designs include cutting edge, energy-saving innovations to reduce carbon footprint and utility costs. Units are manufactured off-site in modern, state-of-the-art factory facilities, reducing overall build time by up to 50% compared with conventional building. Unlike traditional building sites, weather delays don’t have to be factored in, and modular houses can be installed where site access is difficult, and with minimum disruption. The houses are assembled not by traditionally skilled tradesmen but rather by manufacturing and engineering trained factory operatives. This opens up the possibility of significantly contributing to the shortage without the need for finding more scarce traditional resource that is clearly not available in the UK. (1) manufacturing modular housing in this manner offers considerable time benefits. As the modular houses are manufactured on a flow line there is no risk of late delivery. They can be manufactured at rates of twenty or more per week, with no more than a four week construction time. (2) Modules are constructed to exacting quality levels in the controlled factory environment and with as much as 75% of the buildings manufactured offsite, the risk of accidents on site is greatly reduced. (3) Such offsite housing products are designed to a standard that meets all 5 main elements required to achieve a BRE Green Guide Rating of B or above, and are designed to achieve a Code for Sustainable Housing Level 3 or above. (4) Modular housing is designed from the outset to be an affordable, yet high quality, home. Its costs are design and site dependent, of course, giving clients design flexibility coupled with achieving value for money. (5) Running costs are also kept to a minimum as standard insulation values are around 25% higher than building regulations. Exceptional airtightness ratings can be achieved and many other eco features are also available. 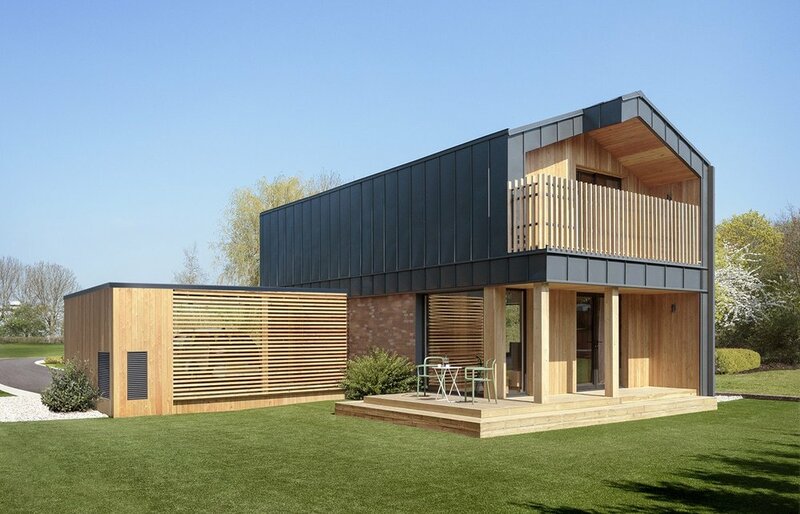 Modular homes, it seems, could well be the sustainable future of house-building in the UK. The average adult has about 3.6 kilograms, or about 2 square metres of skin. It's our largest organ, and one that we should take care of. After all, it regulates your body temperature, as well as acting as a barrier, protecting the body from harmful things in the outside world such as germs and toxins, moisture, the cold and the Sun's rays. Unlike my lawn, which is just about frazzled, I intend keeping my skin healthy. Every summer, at the first sight of the Sun, I reach for the sunscreen in the bathroom cabinet. Last year's sunscreen, or maybe older. Purchased without a great deal of thought for what's in it, just as long as it's labelled as being high protection strength. Like most of us, I should probably care a whole lot more. It's not just me, though. People are looking for safer, non-toxic and preferably plastic-free sunscreens, which is great news. Unfortunately, the selection remains rather limited at the moment (although there are many more options out there compared to a couple of years ago). So what’s the issue with conventional, off-the-shelf sunscreens? Where to begin…? Given that our skin can absorb what we put on it, I'd prefer to put as few ingredients on my skin as possible. I'd also like them to be as organic and safe as possible. Conventional sunscreens can contain a cocktail of toxic, synthetic chemicals that are known hormone disruptors amongst other health risks. On a bigger scale, it turns out sunscreens are destroying coral reefs, which we are learning are the “rainforests of the oceans”: home to a whole host of plant and animal species, they protect coastlines from erosion and they can be a vital store of carbon. Oxybenzone (Benzophenone-3, BP-3), a chemical found in thousands of conventional sunscreen products, is not only toxic to coral reefs (disrupts coral reproduction, causes coral bleaching, damages coral DNA), but also damaging to algae, sea urchins, fish and marine mammals, causing - amongst other things - hormonal disruption. Measurements of oxybenzone have been found 12 times higher than levels considered safe for seawater coral reefs in waters around Hawaii and the US Virgin Islands. Consider this: swimmers, scuba divers and snorkelers are releasing between 6,000-14,000 tonnes of sunscreen into coral reef environments each year. “It is estimated that 10,000 tons of UV filters are produced annually. On average about 25% of the sunscreen ingredients applied to skin are released in the water over the course of a 20 min submersion." Charlotte Vohtz, Founder of Green People. So, there's a clear message: conventional sunscreen isn’t great for our health or for the ocean and the life it holds. But there are better sunscreens out there – ones that use certified organic ingredients without nanoparticles, relying on uncoated zinc oxide as the only sunscreen. Zinc oxide is a mineral that does not absorb into the skin, instead providing a physical barrier that sits on top. This can mean a slightly white film appearing on the skin. I think that's a small price to pay, if it means my health and the environment aren’t at risk. Then, of course, there's the plastics question. My other criterion in searching for that green sunscreen is that it shouldn't come packed in a plastic bottle or tube. Stainless steel tins or biodegradable cardboard tubes are being used now, and it's possible to purchase such products in the UK. Unfortunately, even in the eco-friendly market, not all sunscreens are equal. Be wary of brands that say they offer “complete protection” without any further detail – this is to get round marketing regulations. Instead look for ones that specifically say that they give both UVA and UVB protection. Also be wary of sunscreens saying they offer protection above SPF 50, as there is no evidence anything above SPF 50 offers increased protection. This also fools you into thinking you can reapply less – you still have to reapply the cream every couple of hours regardless of the SPF. 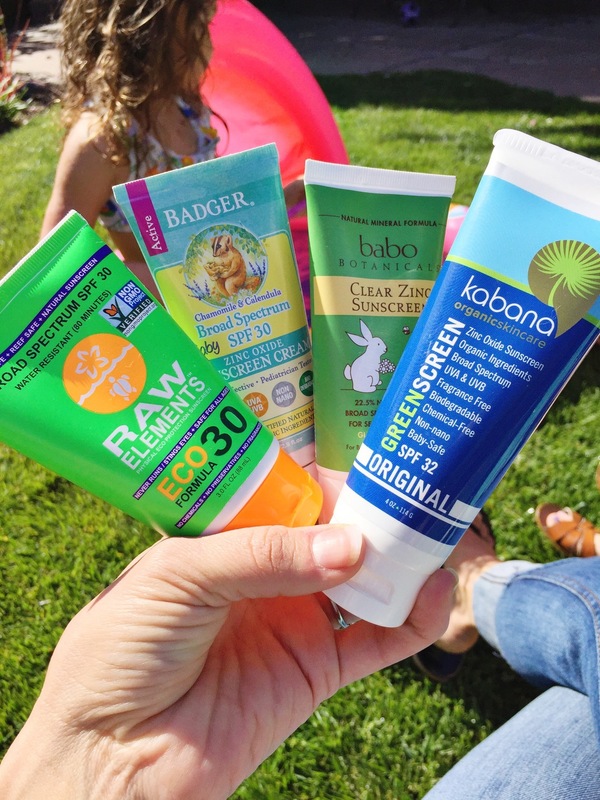 Badger Sunscreen is one of the best eco friendly sunscreens on the market, offering a sun protection factor of 30, and protection from both UVA and UVB rays. It’s 100% chemical free, contains 87% certified organic ingredients, and is hypoallergenic – making it safe for every member of the family, even little ones. What's more, it’s completely biodegradable and won’t cause any harm to reefs or other aquatic ecosystems. And for the final thumbs up, it’s not tested on animals, although it’s not vegan (it contains beeswax). Jāsön eco-friendly sunscreen offers a hefty SPF45 protection from both UVA and UVB rays, making it great for all of the family. It’s gentle and non-irritant and rubs in well. It’s not tested on animals and vegan friendly, but not reef-safe. For a reef-safe product, choose the Jāsön Mineral SPF30 sunblock. Invisible Zinc SPF 30 Sunscreen is apparently the eco-friendly sunscreen choice of celebrities, if that impresses you. It's a light and non-greasy eco-friendly natural sunscreen offering very high UVA and UVB protection. Unlike other creams, Invisible Zinc provides a physical (not chemical) barrier between you and the sun using only one active ingredient: Zinc-Oxide. Zinc Oxide is a mineral reflector found in nature, which creates a reflective barrier on the surface of your skin. As it’s low on ingredients it’s suitable for use on all skin types, and the good news is Invisible Zinc is also vegan friendly, and not tested on animals. There is a growing market for these products, so be aware that new brands are hitting the market all the time. Take time to look closely at their composition and packaging. Your skin deserves it! With the 2018 FIFA Football World Cup about to kick off in Russia, the host nation facing Saudi Arabia on Thursday, the eyes of football fans will be on the 22 players on the pitch. There may be a few distracted by the magnificence of the stadia constructed for the tournament, but few will spare a thought for the overall sustainability of this global event. How will Russia 2018 impact upon the environment? How will it leave a positive social legacy? These are important questions, not only for all large events that see thousands travelling from around the world in order to attend; but also in relation to the specific circumstances of the world's largest country (making up 11% of the world's landmass, with a population in excess of 144 million). It is estimated that the event will generate over 2.1 million tCO2e. At 74.7% of this total, international travel to Russia and travel between host cities are the major contributors of these emissions. Unsurprising, really: the FIFA World Cup is the largest single-sport competition in the world. Staging a tournament of this scale inevitably has an impact on the environment. Russia 2018 has a bold sustainability strategy, following the framework set out in ISO 20121, specifying the retirements for an Event Sustainability Management System. It aims to ensure that the event is (1) financially successful; (2) socially responsible; and (3) reduces its environmental footprint. Done properly, it can boost motivation of those working on the event, helping to attract and retain the best talent. It can enhance reputation and strengthen relationships with key clients, suppliers and partners. It can achieve cost-savings in terms of material consumption, waste and energy; reducing carbon emissions over the entire event supply chain. And it can strengthen the position of the organising body within the community. Working in partnership, FIFA and the Local Organising Committee are supporting initiatives in the areas of health and decent work and capacity building, inclusivity and equality, social development through football, as well as healthy living and sustainable sport legacy. These include tackling social issues through football programmes for young people; the promotion of healthy lifestyles (stadiums will be 100% smoke-free), football development and youth participation in football; and ensuring the sustainable use of the stadiums after the event. Inclusivity and equality have been key areas for attention, and actions include ensuring fully-accessible events and transport services for disabled people and people with limited mobility; the creation of opportunities for low-income groups to obtain tickets for matches; and ensuring a discrimination-free environment at all sites and events. Addressing environmental concerns, FIFA and the Local Organising Committee have focused on (1) green building standards, to include developing the sustainable management capacities of stadium operators; (2) transport, carbon, energy and waste management; and (3) risk mitigation and biodiversity. With the aim of reducing the environmental impact and raising awareness of climate change, FIFA has launched a campaign encouraging successful ticket applicants to offset the carbon emissions resulting from their travel to the tournament for free. All ticket holders are invited to sign up on FIFA.com and take part in the campaign, regardless of where they live. For each ticket holder signing up, FIFA will offset 2.9 tons of carbon dioxide equivalents (tCO2e), which is the average emission per ticket holder traveling from abroad. The incentive to get fans to sign up is that they will automatically enter a prize draw to win two tickets for the FIFA World Cup final at Moscow’s Luzhniki Stadium. This is in line with its long-running environmental program and its more recent pledge to the UN’s Climate Neutral Now campaign. So, FIFA will offset all unavoidable emissions over which it has control, plus up to a maximum of 100,000 tCO2e for the ticket holders who sign up. The list of offsetting projects selected will include verified low-carbon projects in Russia and abroad. As those supporters arrive in the impressive array of 12 new and refurbished stadiums as the tournament kicks off on 14 June, they will all have undergone a standards certification process for sustainable buildings, either through the new Russian certification or through the BREEAM international certification (e.g. the Luzhniki and Spartak Stadiums in Moscow and Fisht Stadium in Sochi). Ensuring that the stadiums are designed to BREEAM standards will raise the bar of sustainable design and construction in Russia. Certainly, prior to this event, regulations in green building were not well developed, with few incentives to implement green technologies. It is important to recognise the significance of this achievement by the design team. Energy conservation is achieved through modern heating, ventilation and air-conditioning systems, as well as bringing together all essential utilities into one automated central system. This will allow complete monitoring and control of how much energy the building is consuming. Using LED-based lamps instead of incandescent lights will save a significant amount of electricity. The lighting outside the venue was also installed using electricity-saving strategies. Water-saving technology at the stadium will allow hundreds of thousands of litres to be saved during a match at full operational capacity. Large green spaces and a high number of trees already present in the vicinity were preserved during the reconstruction, while even more greenery was also added. According to the stadium managers, 1,050 trees and bushes were planted, and 15,700 square metres of flower beds were laid down. Part of the Sustainability Strategy is the development of a waste management plan for organising tailor-made waste collection and recycling processes at all official sites and events – along with the communication tools to inform and motivate spectators to dispose of their waste accordingly. 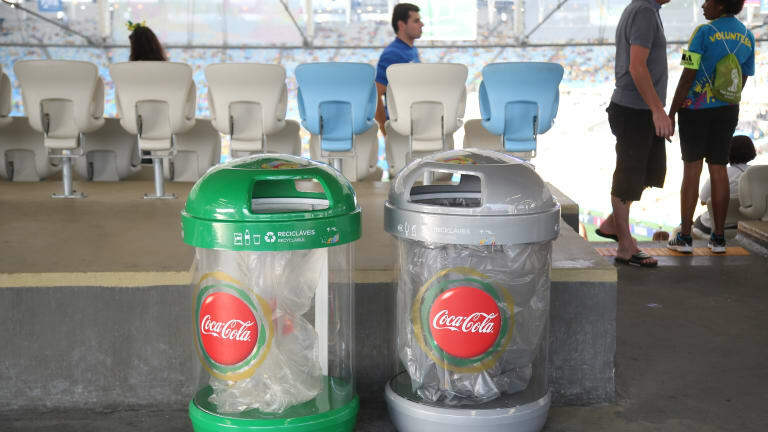 So, at last year's FIFA Confederations Cup in Russia, recyclable material was successfully segregated from general waste: 87.9 tonnes of glass, PET, aluminium, paper and cardboard were separated and recycled. The use of waste compactors will enhance the transportation and storage of waste ahead of reprocessing. Furthermore, public transport information points aim to help visitors travel more sustainably, with site layouts designed to prevent the intersection of pedestrian, parking and delivery pathways. Free train tickets are available to supporters during the event, in a bid to encourage rail rather than air travel. The introduction of new, state-of-the-art hybrid trams will also see a sustainable transport legacy from the event. For the first time, ecological and biodiversity studies have been undertaken that go beyond typical local construction practice requirements, with measures to enhance local biodiversity. Crucially, , compliance has been strengthened around operations and regulations governing specially protected sites. In this way, it can be hoped that future construction and infrastructure projects will pay greater attention to environmental concerns. With kick-off looming, it just remains to wish all nations every success (although we're obviously getting behind the England team to win it! ), and hope that the true winners from Russia 2018 are the environment and communities impacted by this massive global event. Packaging is the first thing that consumers see, and it can heavily influence their buying decisions. Can you replace a rigid container with a pouch? Are you removing a carton and letting a toothpaste tube or bag of cereals stand on their own on a shelf? How about creating one bulk pack instead of multiple single-serve items? Can you switch materials, such as using PET instead of PVC because it is easier to recycle? Would it be more efficient to change from a round to a square container, in order to be more space-efficient? How can you ensure faster set-up times on your packaging line, to minimise the amount of materials required and packaging waste generated? Have you made consumers aware of the value of your packaging and how it can be re-reprocessed or reused? 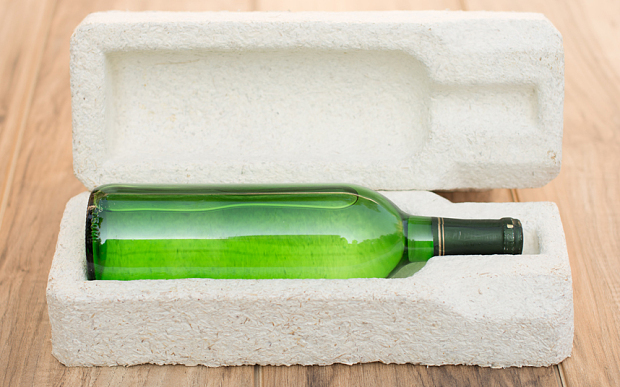 Of course, sustainable packaging is no longer focused on just recycling. Nor is it the sole focus of a company's greening targets. Rightly or wrongly, packaging is disproportionately scrutinised and used as a measure of a company's overall sustainability credentials. This may seem unfair, given that it may contribute a relatively small proportion of the Carbon footprint compared to other things, such as transportation, water and energy use. There is a particular focus on end of life, with the result that many businesses are looking at closing the loop, to ensure collection, re-cleaning, reprocessing and remaking of packaging within a relatively short timeframe. However, I would argue that true sustainable packaging needs to go well beyond consideration of its environmental impacts, to consider the social impacts, too. A far-reaching chain-of-custody certification which includes ethical material sourcing and manufacturing conditions is essential; and it's true economic cost needs to be taken into account. Sustainable packaging is rife for rethinking, to identify innovative solutions to the challenges faced across all business sectors. The surge in public interest around environmental pollution resulting from plastics is driving regulatory responses by governments, and conscious consumers are making purchasing choices based on what they consider to be more sustainable options. The development of plant-based, compostable bioplastics is accelerating (e.g. Coca-Cola's PlantBottle). But bioplastics are just one alternative - bamboo, wheat straw and mushroom-based packaging are at the forefront of a packaging revolution. Two particular personal frustrations are the ubiquitous crisp/snack packaging and take-away packaging, e.g. pizza boxes. Why must we continue to see bags made from up to seven separate layers of foil and plastic? Yes, I do appreciate that this makes them light, reduces their shipping volume, ensures that they don't take up much shelf space, and results in them being graphics-friendly. But, they're not recyclable because the machinery is not yet out there to separate the layers. Why can't we recycle this? There are currently no plastic-free or recyclable crisp packets from any brand. As for pizza boxes (and other take-away containers), they're made of recyclable materials. The trouble is that they get contaminated, as cheese and other food scraps stick to the cardboard. Then they're no longer recyclable. Let's makes consumers aware of the value of the packaging, possibly by offering an incentive to clean and recycle boxes. Alternatively, let's see a move across the sector to compostable containers. So, while it is true that the first impression makes the best impression, we live in rapidly-changing times and more than two-thirds of consumers say that sustainability of packaging now influences their purchasing decisions. It's time to step-up to the challenge. Switching over to sustainable packaging can result in a change in the overall cost to a business. The cost incurred may not be at a skyrocketing rate in most cases, but undoubtedly higher than traditional packaging designs. These additional costs are eventually passed on to the customers by companies to maintain their profit levels. Sometimes customers might start feeling that they are being overcharged for the same product, but the trend towards conscious consumers is real. Increased regulation will also act as a driver to change behaviour. You can't afford to be left behind. You might have amazing ideas for incorporating sustainability packaging into your business, but at the same time, you need the help of experienced designers and marketers for implementation. Designers can help you identify the packaging that is best suited for your product without compromising the quality and appearance of packaging. At the same time, marketing professionals can help you pave the way to attract more customers.. It's essential that companies understand their entire product lifecycle and choose the materials that are best suited for their products rather than choosing the most sustainable packaging option in isolation. Not all types of sustainable packaging can help retain the quality and intactness of the content inside for a long period, and this is certainly an area for more research. By consulting experts, businesses can make informed packaging choices to provide the most durability with reduced costs, and be authentic in their commitment to sustainability. At the end of the day, it is all about choosing what is right for the brand. Th question is "can your business afford to ignore the waves of change?" - first impressions count! It's been an interesting couple of weeks. I've spent them rushing around, physically and mentally, trying to deliver on many levels and get clarity about what motivates me. Meeting with board members - my wise owls - challenged me to come up with some answers, to set out a clear vision. Tough love, some call it. John Izzo and Jeff Vanderwielen, in their book "The Purpose Revolution", describe as the first step needed to thrive in the age of social (and environmental) good the need to clearly find and name your purpose: namely, you must live the purpose you profess. Catchy soundbite, that! But, what does that mean when you're faced with the daily challenge of securing customers for your business; when you have an empty order book; when the lack of income is impacting on your life, and that of those around you? My purpose has always been to help others on their sustainability journey, to show them a way to generate social and environmental good alongside being profitable. But there's the thing: where is my profit? Like it or not, I'm not running a charity. I have to earn enough to live, how ever frugally. So, I need to have an offering that people want (not simply a service that they need). Bearing all of this in mind, I'm focused on building a relationship with customers (or rather, businesses that will become future customers). Engaging them, demonstrating that I genuinely care about their wellbeing - as much or more than I do about any profits. I'm also still concentrating on the purpose of Earth Matters to helping society solve its problems, crucially promoting a more sustainable way of living - a true circular economy. Am I activating those twin purposes? Yes, research shows that focusing on purpose over profits builds business confidence and drives investment (Deloitte, 2014 Culture of Purpose study). Companies leading with real purpose are found to build a deeper relationship with customers, going beyond the transactions of buying and selling; connecting with the customer. All well and good. The problem is the inherent tension between a profit focus and a purpose focus. It's quite a challenge. Inside your head are two voices, each trying to drown out the other. Purpose or profit? Oil and gas companies struggle with this, and frequently struggle. 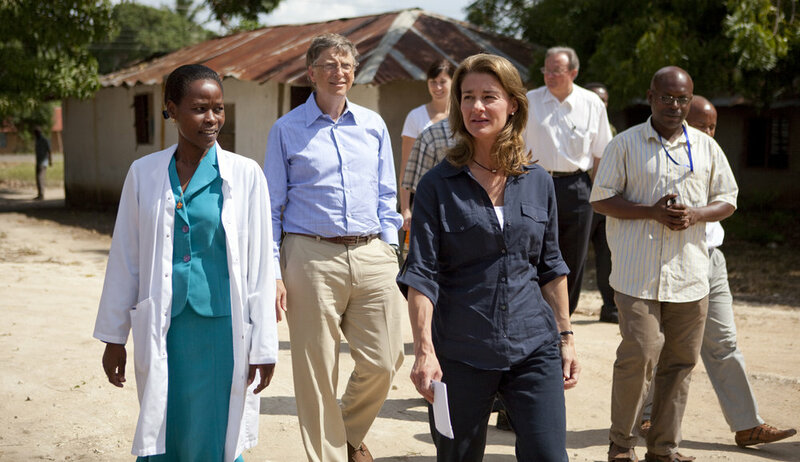 Yes, they can talk a lot about purpose and how they are leading society's journey to a renewable future. But, they tend to fall short of actually delivering on this, as profits trump their purpose aspirations (too much short-term thinking, as they seek to keep shareholders happy). Talking the talk on a renewable future, while undertaking exploratory fracking, does not go down well! There's also the authenticity question. Companies can tell a good story and appear - at least for some of the time - to be delivering on their promises while under the spotlight. Unfortunately, in the cover of the shadows, their performance can be anything but authentic. Take Volkswagen, for example. Clean diesel was the message, but this was dramatically undermined as they devised software to trick the emissions tests. Once found out, the damage to the brand has been considerable. VW, a brand irreparably damaged? Businesses also need to be credible and avoid over-promising. I recognise this challenge only too well. As companies jump on the purpose bandwagon, it can feel forced and unclear. It needs focus, preferably on an issue that's directly within the business' sphere of influence. At the same time, some businesses (and I've met many, particularly among SMEs) have a well-established purpose but tend to stay quiet about what they are doing, before suddenly finding their voice. A consistent approach is crucial if you're to be believed. It's all about balance, consistency, and authenticity - you've got to mean it, passionately. So, when times are rough and you find yourself unclear about your purpose, take time out to refresh your purpose statement, decide where you fit, and then share your drive in order to activate that purpose in yourself and those around you. It needs reconnection, headspace, call it what you will. I'm off to do the work to find, define and shout about my purpose. Getting back on the bike after a wobble or a fall is never easy, but it's the way to be successful. For me, the challenge of pulling together a new workshop "Creating the Waves of Change" is helping to clarify my ideas and set out the purpose I seek. Perhaps it can do the same for you. Get it right and you can have purpose and profit. In National Gardening Week, you'd expect a little more sunshine and temperatures to match. But, let's not allow the weather to get in the way. Gardening is good for the soul and helps to keep us fit. That's official. Numerous studies have found clear health and wellbeing benefits. Gardening can bring about positive changes in the lives of people living with disabilities or ill health, or who are isolated, disadvantaged or vulnerable. It features in the fantastic work carried out at our local Dementia Resource Centre, which we've been privileged to support through working parties to keep the communal gardens in shape. It's very much at the heart of the philosophy of wonderful community growing spaces such as the Green Backyard and the Olive Branch, here in our city. In a strongly multi-cultural community, gardening brings people together to share in a common experience, where they can exchange ideas and learn together. It has the potential to teach people how to grow their own food, learn about business opportunities through growing flowers, herbs or keeping bees. It can help to reconnect people with the simple joys of getting their hands dirty, nurturing their crops, and cooking healthy, home-grown food. We've watched families and friends come together in the process, relationships refreshed. The benefits of gardening are seemingly endless, both mentally and physically. Not only can planting bulbs, digging trenches and pruning roses vastly improve your physical health, but it can also improve mental health too. Gardens are often thought of as intimate private spaces attached to private households but they can also be large private or formal gardens open to the public, or part of hospitals, care homes or hospices. Gardens serve many purposes: they can be cultivated for flowers or growing food; used as spaces for exercise, relaxation, solace and recovery; used as places to play, meet and volunteer; and can be part of wider environmental, planning or sustainability policies. Half of the adult population in England report being involved in gardening, and it is an important activity throughout our lives, reaching a peak just after retirement and declining as we age further. However, as we age it becomes relatively more important as other pastimes and activities reduce more quickly. Gardens are therefore important to our health due to the numbers of people who engage with them in many different ways and for different reasons. Increasing people’s exposure to, and use of, green spaces has been linked to long-term reductions in overall reported health problems such as heart disease, cancer and musculoskeletal conditions; it has also been linked to reduced levels of obesity and high physical activity, and higher self-rated mental health. Living in areas with green spaces also seems to weaken the effect of income inequalities on health. Gardens can provide other important environmental functions, such as reducing flood risk and moderating climate and pollution, which have knock-on benefits for health. 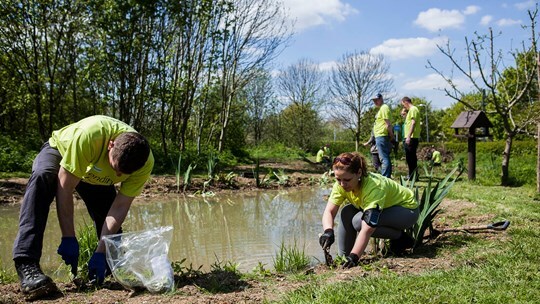 These are just some of the positive reasons why engagement with gardening and greenspace management ticks all the right boxes for companies that are looking to add value, to demonstrate a genuine commitment to Corporate Social Responsibility. Given our own drive to be purpose-focused, we're looking at engaging isolated communities, including recent refugees from Syria, in growing together sessions; building a circular economy around the repurposing and reuse of garden tools through a 'sharpen up' project, aimed at providing a sociable environment in which retired people can meet and work together. 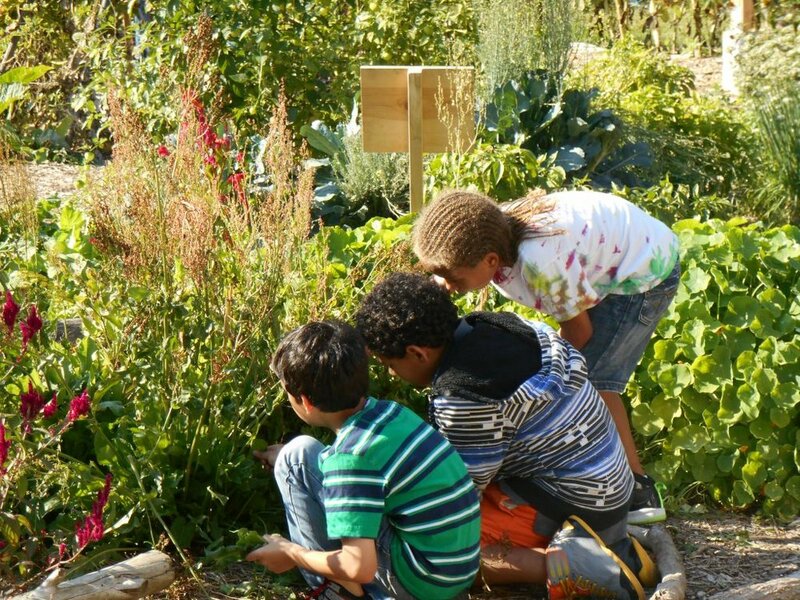 Looking to the next generation of gardeners, there are exciting opportunities to engage children through school gardening activities. Studies suggest that children’s fruit and vegetable intake can be significantly increased combined with efforts to improve parental support; a further range of studies points to increased knowledge, and preferences for fruit and vegetables. Teachers report positive wellbeing effects, personal achievement and pride in ‘growing’ and, where volunteers are involved, gardening can be a way to break down social boundaries inherent in academic settings. For children with learning difficulties or behavioural problems, gardening as a non-academic task and the garden as a place of peace and meditation are particularly valuable. Of course, we recognise that so much more needs to be done: to make the space and time available for gardening within the teaching day. With initiatives such as the Eco-Schools network, with 18,000 registered schools in England, alone; we're heading in the right direction!